This january, I went on holiday to Kerela, where I behaved like a child at a playground in the plantations. All my favourite ingredients (cacao bean, cinnamon, vanilla, peppermint!!!!) growing in touching distance, can you blame me! I bought a bunch of vanilla bean from their local store and it. is. GREAT ! It’s fresh and fragrant and full of flavour. There’s so many varieties of Vanilla, that it’s totally incredible. The most predominant ones are Madagascar, Mexican (the star of any great mexican hot chocolate) and Tahitian (the most fruity and fragrant kind). If anyone gets there hands on Tahitian Vanilla - let me know! So i finally got around to using another vanilla pod from my Kerela stock. I made this delicious Vanilla butter cake last weekend, and I’m in love. It was so good, I made it again the next day, exactly the same way. It is moist and soft and so addictive. I’m not exaggerating when I say that this cake has changed my life a tiny bit because I don’t think any other plain cake will ever be as good. It doesn’t need any frosting at all - you can eat it with a dollop of cream, it melts in your mouth! Hope you enjoy it as much as I did ! Line a 9-inch cake pan with parchment, and brush with butter and flour. Heat the 1/2 cup cream in a saucepan with the vanilla bean. When it is boiling, remove from heat. 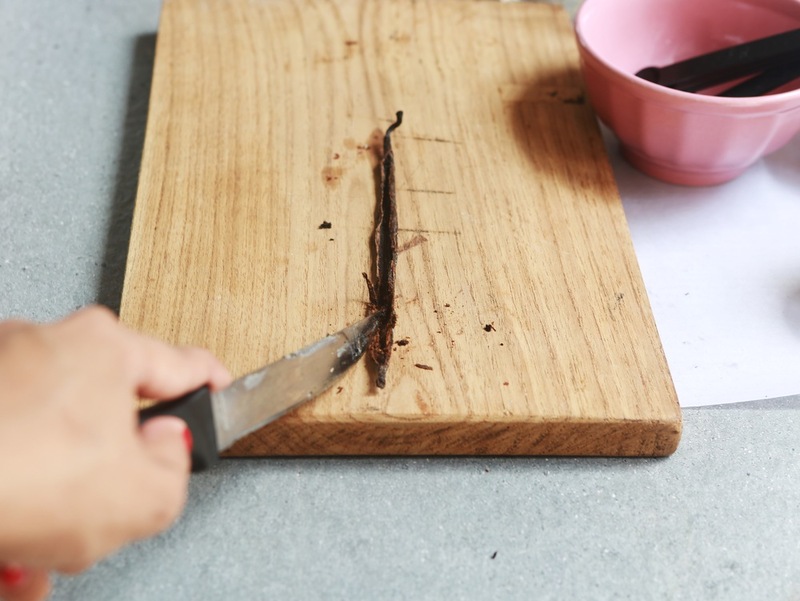 Cut a slit through the vanilla pod and scrape out the seed into the cream and mix. Now remove the pot and keep aside. In the bowl of a stand mixer, combine dry ingredients (flour, cornflour, baking powder, salt, sugar). Add the mixture to the flour-butter mix in 3 turns, scraping down the sides of the bowl, after each. Pour batter into a 9-inch cake pan. Bake for 30 minutes or until a toothpick comes out clean. Let it cool before inverting. Slice and serve at room temperature with a spoonful of whipped cream. If you don’t have vanilla bean at home, I recommend buying some. It is a tad more expensive than you might think (100 bucks for 1 pod) but it is totally worth it. You’ll probably find it easily at any gourmet cooking store like Modern Bazaar or Nature’s Basket. Don’t throw away your used vanilla pod. It still has tons of flavour. Rinse it with water, dry, and store it in a container of sugar.